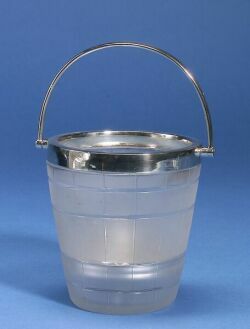 English Silver Mounted Glass Ice Bucket, Sheffield, 1963, W. Hutton & Son, Ltd., makers, with tapered cylindrical frosted glass body cut with linework as a bucket, with silver rim and swing handle, interior with pierced liner, ht. to handle 8 1/2 in. W. Hutton & Son Ltd.